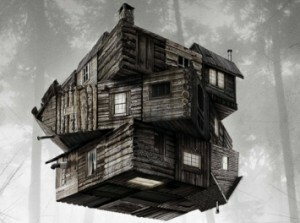 Of all the words that can be used to describe The Cabin in the Woods, the new satirical horror film by Joss Whedon and Drew Goddard, one I can’t imagine anyone using is “predictable.” Cabin is a delightfully strange movie, and no matter how much you know about it, I can almost guarantee it’s not what you’re expecting. Depending on your taste in film, that’s either going to be what you love about the movie or what you hate about it. It’s for a very specific group of people: horror fans who have laughed and cheered as Jason Voorhees, Michael Myers, Freddy Krueger and the rest of the gang hunt down teenagers, who always split up when they should stick together. If, like me, you have seen countless films of this kind and are looking for something fresh, Cabin is for you. It’s extremely clever, fun, inventive and, like Wes Craven’s self-aware slasher film Scream, it breathes a completely new life into its genre, with a final act that is truly unexpected. Simply put, it’s the movie horror fans have been dreaming of. But be warned: this is for horror fans only. If you aren’t on board with this film’s agenda, you’re in for a bad time. Right down to its purposely generic title, The Cabin in the Woods sets you up for a totally different movie than what you think you’re in store for, and that’s part of the fun. A group of five friends decide to spend a weekend at a remote cabin in the middle of nowhere, where partying, swimming, and drinking ensues. They stop for gas and are intimidated by a strange old man who warns them of the dangers that lurk ahead. They laugh him off and continue on down the unpaved, dirt road. If it sounds like you’ve seen this premise a hundred times before, that’s the idea. Meanwhile, we follow two office workers dressed in button up, short-sleeved shirts chatting about their personal lives over a cup of coffee. They’re in some sort of factory on their way to do something we aren’t quite sure of yet. How are these two plot threads connected? That’s something I don’t dare spoil. One way Cabin differs from your typical horror film is that its central characters are actually likable, and they banter back and forth with genuinely well written dialogue, something Joss Whedon is skilled at. In too many films like this, we’re actually rooting for the monsters to kill the teenagers, who are completely unbearable and exist only to have elaborate death sequences. Despite the satirical nature of the film around them, the characters play it straight. The teenagers behave as if they’re in a serious horror movie, and these young actors do a good job of capturing that. Among the teenagers Fran Kranz stands out, playing the aloof but lovable stoner character, Marty. Within the office storyline running parallel to the cabin, Bradley Whitford and Richard Jenkins are hilarious and perfectly cast, playing two office workers in charge of a mysterious operation. They deliver their extremely dry, satirical dialogue with zero irony, and get huge laughs when they go for them. But that’s not the only way Cabin is not your typical horror film. The screenplay was written by Joss Whedon and Drew Goddard, who previously collaborated on Buffy the Vampire Slayer. Like Buffy, Cabin plays around with the tropes of its genre in a lot of clever ways, like how every slasher movie has the dumb blond girl, or how the characters always make incredibly stupid decisions to get themselves killed because, of course, that’s what has to happen. Otherwise, the movie would be breaking the mold and giving us something new. As we’ve seen, giving fans something they aren’t expecting is rare in horror, but Cabin in the Woods succeeds at that in a big way. It lays out a formula for us and then completely shatters it. But unlike many horror/comedy mashups of this kind, Cabin in the Woods doesn’t just point out the tropes of horror films. It actually incorporates them into its mythology, which I found genuinely compelling. Have you ever wondered why the slasher genre is so popular, and why its formula has remained basically the same for all these years? Cabin addresses this in an incredibly clever, while intentionally over the top way. The film is extremely self aware, going as far as to make subtle references directed at us, the audience watching the movie, asking why it is exactly that we pay money to watch people suffer. It’s very much a commentary on horror movies, indulging in with what’s good about them and mocking what’s bad about them. But even putting aside the film’s central message, Cabin in the Woods is just a lot of fun because it totally embraces what horror can do at its best. Whedon and Goddard want you to believe you’re in for a generic, run of the mill slasher film, so they can laugh in your face and destroy all expectations as the movie completely implodes in on itself. If my description sounds incredibly vague, it’s because I’d hate to ruin any of the surprise. Some audiences will be put off by where Cabin takes them. I found it refreshing to see a mainstream release so daring and so absurdly original, however over the top it becomes. This movie goes places I would never expect to be taken. It’s not the most accessible movie in theaters at the moment, but if you’re a part of its target audience, The Cabin in the Woods is one of the most fun and original horror films of this year and many others. April 19, 2012 in All Movies.